The Book Crowd: Phryne Fisher's electronic adventure! Stuck on the train with nothing to read? 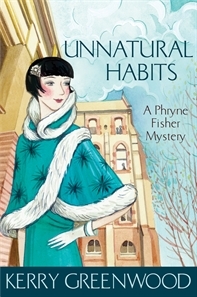 Forgot to borrow the latest Miss Fisher from the library today? and you've left your Phryne Fisher book in the car?!?! Our eBook library is here! So have your iPad, eReader, tablet, phablet, smart phone, PC, pearl handled pistol and PIN at the ready to read, download and enjoy Miss Fisher mysteries wherever you go! What's it all about? Three young and very pregnant girls go missing from a lying-in home in Melbourne. A pushy and highly ambitious reporter decides to search for answers in all the most dangerous places, only to get abducted herself within 24 hours. Everyone, including Jack Robinson, is decidedly nervous and so Miss Fisher with the aid of her helpful household brood is on the case. I confess that I am still reading this book so I cannot provide a full analysis, but I can say that I am reading this with deliberately slow relish, like sipping a divine cocktail concoction from Mr Butler, I simply don't want it to end.